Marble is beautiful to look at especially on floors, and it proves to be a popular choice for a large number of homemakers. One can improve the elegant look of his/ her interiors by making proper flooring choices. However, the natural luster, as well as the beauty of marble, can disappear with time as a result of scratches and scuffs, grime and spills if not properly cared for, therefore leading to further damages. The luxurious look of marble can vanish away mainly because marbles are very much susceptible to abrasion and scratches. Sanding is a very aggressive process using metal-bonded and diamond grits to remove deep scratches and lippage. It is usually performed by using a heavily weighted floor machine with water. Moreover, this process is typically dust free, and the goal is to flatten the floor. The last thing needed to be done seal the sanded area. We use a marble sealer and apply it liberally with a rag. This process is similar to grinding, but not as aggressive as that. 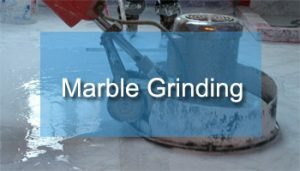 The grits and materials are not as rough as those used in grinding and honing will remove trivial to moderate scratches and etch marks. 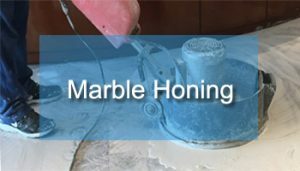 Honing is a process where silicon carbide or diamond particles are rubbed over the surface to shed a small amount of stone. In the process, they remove or flatten out scratches and ingrained soil. Three kinds of honing known are the powder honing, pad Honing, and hard honing. A honed finish can be referred to a satin smooth surface with relatively little light reflection. A honed finish is fancied for floors, stair treads, thresholds and other locations where massive traffic will wear off the polished finish and also, it can be used on furniture tops and other surfaces. This is done after the honing phase, and a series of higher diamond grits are usually used to simulate higher grits. Most natural polishing powders are known to contain the active ingredient oxalic acid, which is also known as potassium oxalate. 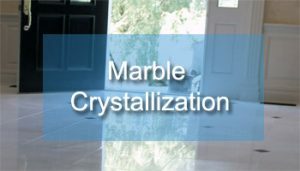 Crystallization is another method of marble floor finishing which improves marble surfaces. It causes a chemical reaction on the surface, with pesticides; a single-plate machine and steel wool which allows the sandpapering of the marble. Crystallization also generates a micro film on the surface of marble, which is more stable and long-lasting and helps to preserve the color and the brightness of the marble. Crystallization is an excellent method for regular stone maintenance. Marble restoration process involves examining your marble nature so that the process can be customized accordingly. The overall explained process can modify the total appearance of your marble completely, making them floors beam like a new ones once again. 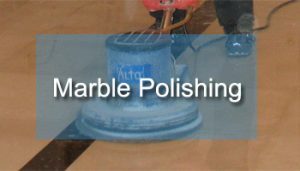 Marble Polishing helps protect against the corrosive or deleterious action of a wide variety of oils, chemicals and salts. This enhanced surface is easily polished with the mechanical action of steel wool pads. Therefore, there is no need for stripping off floors since there is no buildup.The polishing process is excellent at bringing out the intrinsic beauty of marble and also, making it look better for a longer period. Once all due process explained above are followed, the marble is sure to recover its brilliant glass-like finish, which in most cases is deeper than the original quarry-applied finish. Many people use wax on their marble because it can polish as well as protect, but they aren’t aware that it can also lead to discoloration – especially if your marble is white or light-colored marbles. This is because wax can make the floor look duller in the long run by attracting and holding dust and grime, thus, creating a dingy film over the marble which will affect its color. Another issue is that certain types of wax may yellow over time or become clouded by contact with various types of spills. Also, wax can make an already slick stone floor even more slippery, which could result in injury. To achieve the best results, it is recommended that you try other methods first. Using the natural process to polish marbles will allow it not to breathe, thereby causing suffocate. The marble is left to extract moisture from the air when it becomes dry and also push excess moisture when it becomes too wet. The natural process is sure to extend the life of your marble and a long lasting attractive and easy to maintain polished floor is usually the result. Also allow a professional to do the job for you.